In 1979, Rod Olson started making fixed blade knives and hunting knives. After a visit to Henry Frank's shop his knife making expanded into folding knives. After selling his successful silversmith business, Rod is now making knives full-time. 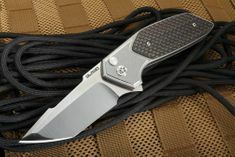 We highly recommend Rod's knives because of their quality and trademark 'Olson' design style. 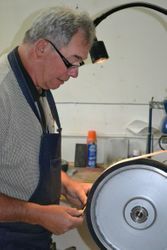 Olson knives are made using the highest quality fit and finish. His designs are modern and utilize high tech materials such as titanium, carbon fiber and cutting edge knifemaking steels. 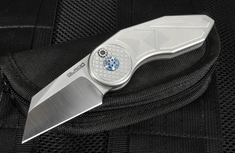 His focus is on creating folders with button lock, lock-back or bearing pivot construction. He commented that, "Knives do not leave my shop without my personal approval and full satisfaction."